Two scientists have uncovered the DNA link to heart disease in a remote Italian mountain village. They have discovered a way to synthesize the cure in order to sell it to the public. They're up for the Nobel Prize and set to make millions after teaming up with an Austrian biotechnology company. But there are factions who make a good living off the number-one killer in America and other companies that want the solution for themselves. 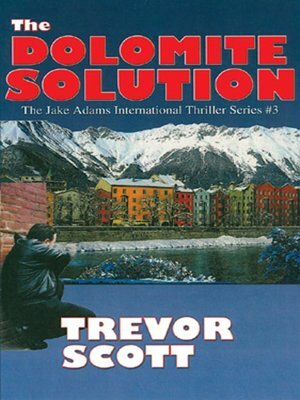 When attempts to steal the new cure lead to murder, there is only one man who can bring the dolomite solution to the public: Jake Adams. Murder, suspense, and intrigue propel this third Jake Adams mystery thriller from the Dolomite mountains of northern Italy to the winding back streets of Innsbruck, Austria, and across the Atlantic to Rhode Island's Narragansett Bay.